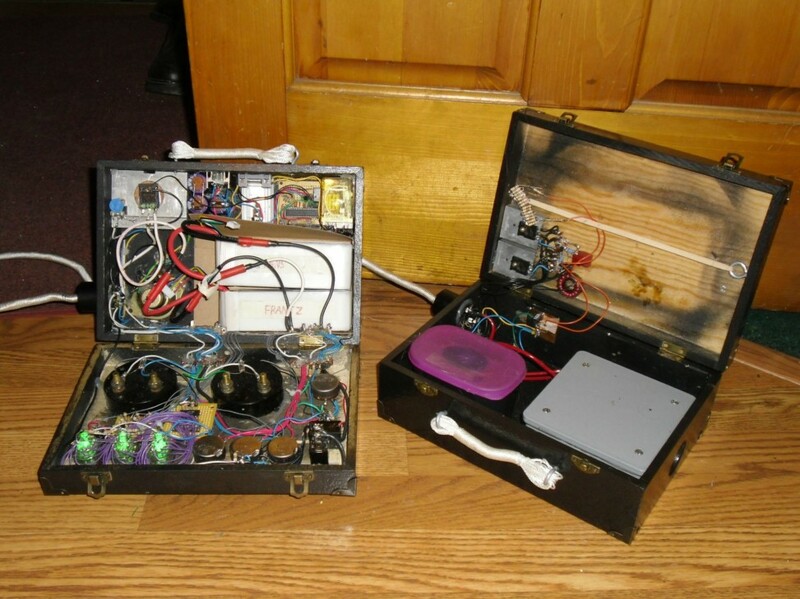 The goal of this project was to build an inexpensive portable x-ray machine, since such a device didn’t seem to exist! Odd, since such a machine could prove to be very useful in remote or underequipped areas such as army camps or poorer countries. The full paper detailing this endeavor may be downloaded here, but the text below provides a general synopsis of the project. Version two is on its way, and it’s going to be bright. So the lead was melted down and a new design drawn up in autodesk. 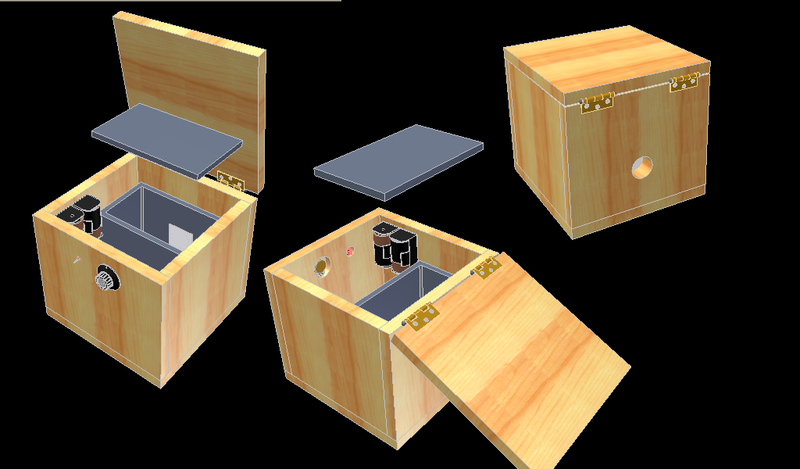 This version was to be a plywood box with an inner lead box, and it was to emit a beam of x-rays. Simple enough. 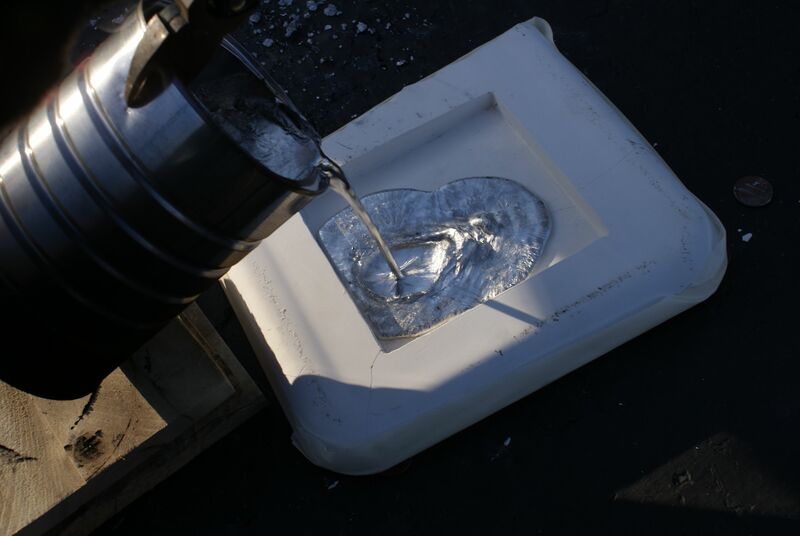 I began a long tedious process of making yet another lead box, this time by first cutting out the shapes from clay, then casting the shapes in plaster. 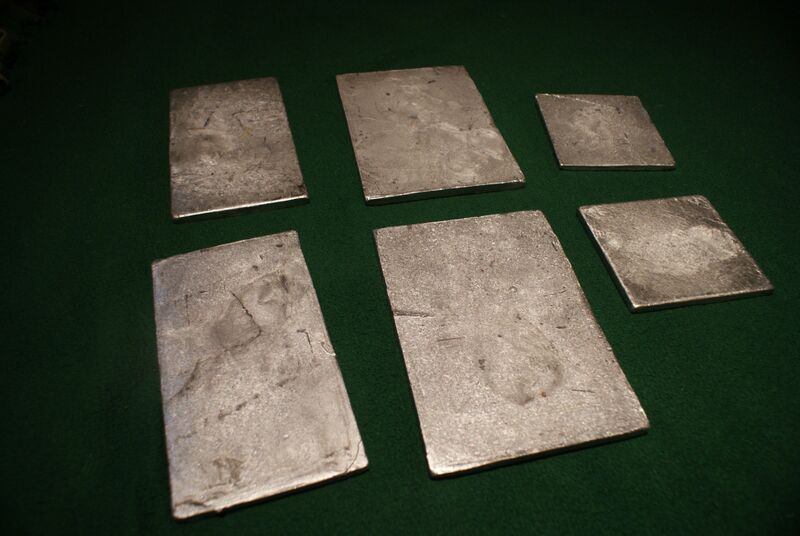 A form of lost-clay casting which would leave me with the 6 sides I could weld together. Sounded simple, but turned out to be a huge trouble due to water in the plaster that could not be baked out. After 5 attempts at casting the parts, I finally ended up with indecent, but usable shapes. 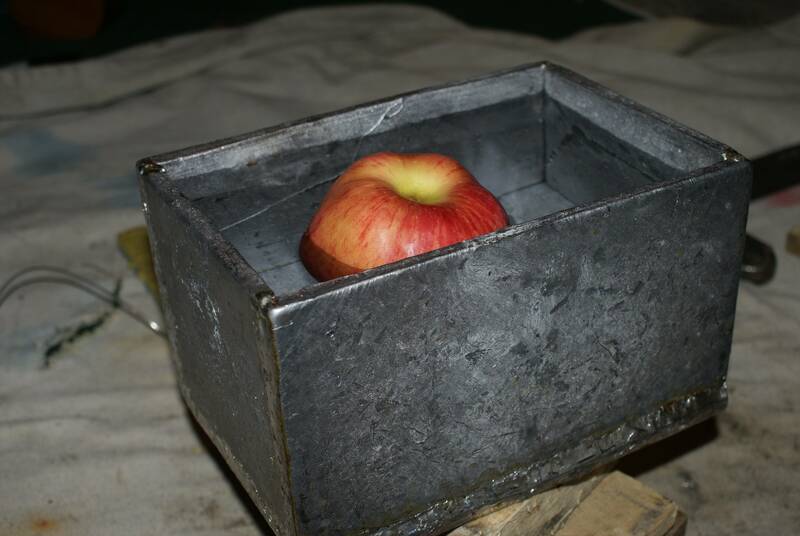 They were then welded together to make an awesome hot box. Apologies for the poor image, my good camera is on loan to someone. The machine is split into two parts: a control box and a ‘tube head’. The tube head is the part that houses the high voltage components and x-ray tube, while the control box houses most of the circuity and the power source (LiPo batteries). Both were designed to be beautiful: burned brass corners, hammered paint finish, unnecessary lighting of the switches, display and meters… Making the device look good took a whole month itself! 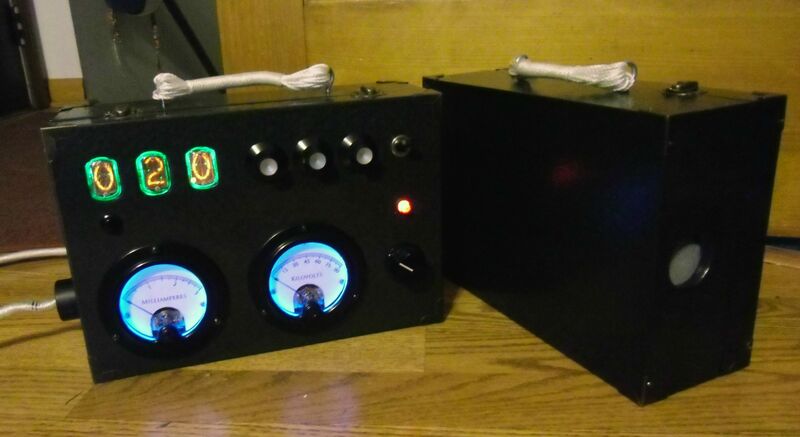 They are connected via removable cable which utilizes two octal vacuum tube bases as the connectors. 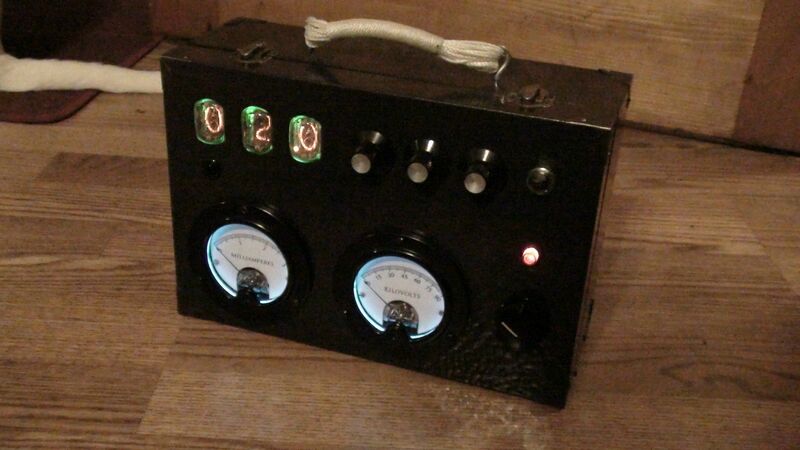 The control box features a multiplexed nixie display, three dials to set the exposure time, another dial to set the kVp as well as two meters to monitor the coolidge tube current and voltage. Along with those controls we have a button to display the oscillator voltage, as well as a speaker and the on-off switch. And of course, the expose button. 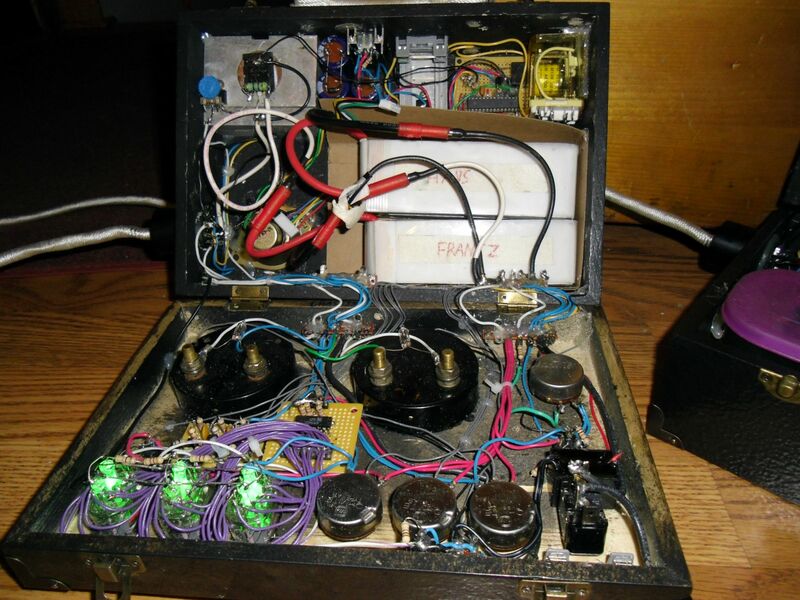 Compared to the outside, the inside of the control box looks to be a disgraceful, awesome rats nest of wires. The brains of the device is an Atmega 368 programmed with the arduino bootloader. I chose a micro-controller over state logic so it’d be easier to add features later. In the end there isn’t much room for improvement however considering I used all but 1 pin! 7 pins are used to drive the multiplexed nixie display, 3 more are used as analog inputs, while another two are used to switch a pair of relays. The rest preform various functions such as monitoring voltages. The microcontroller constantly polls the three time setting knobs when the machine is idle. By mapping each knob to a 0-9 scale, 3 numbers can be established and combined to form 3 digits: 10’s, 1’s and tenths. These are then printed to the nixie display, one tube at a time over a span of 2 milliseconds. As it takes 2ms to write a number to the display, the printNixie() routine was used as the time-keeping routine of the program. 500 printNixie() calls equates to 1 second of passed time, so by using that routine instead of delay() within the program allows the system to keep time without blanking the nixie display. I suppose this could be considered a hacked version of multitasking… maybe. 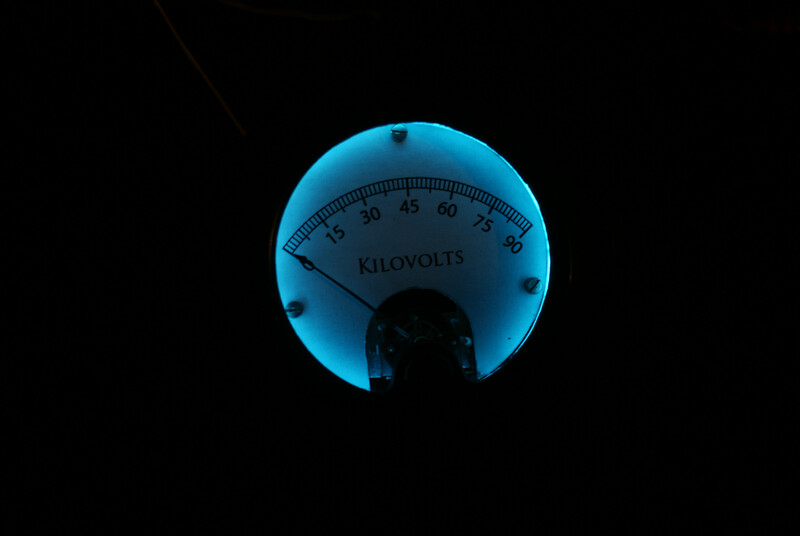 After setting the exposure time, the desired anode voltage is set with the big knob. 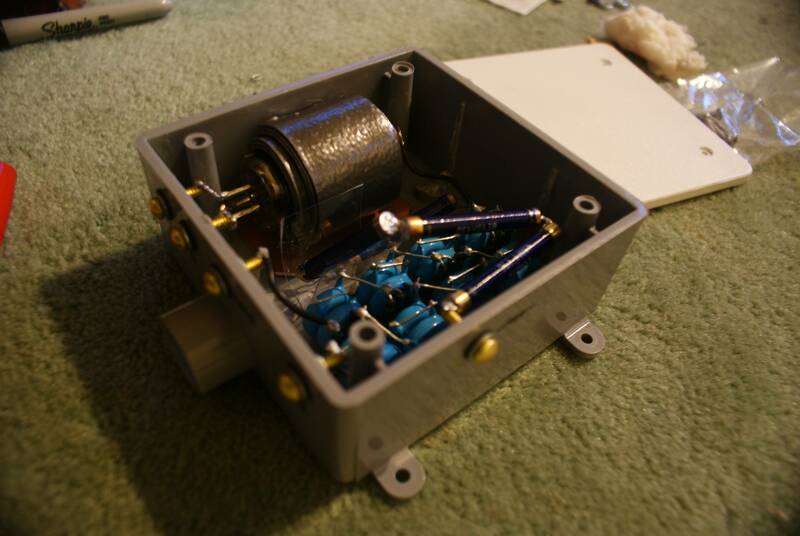 Turning this knob adjusts what voltage the regulator will be fed to the HV oscillator (14 to 35VDC). Pressing the black button will display this voltage on the nixie tubes, so it’s not just a shot in the dark every time you turn that knob. In the future I would like to add a feedback loop, having the microcontroller monitor the actual anode voltage and adjusting the oscillator accordingly. Once things are set, the expose button is pressed and a 10 second countdown ensues. At the beginning of this countdown a small relay switches on and supplies 14V to the tube head. That 14V is then stepped down to 3.5V via a buck converter and fed to the tube’s heater. At the end of the countdown a second relay switches on and turns powers up the HV circuit. The regulator voltage is now given to a ZVS oscillator which churns out 65kHz AC. This power is then sent into a homemade transformer where it’s stepped up to 20kVAC and fed into a cockroft walton multiplier. After multiplication we are left with anywhere from 40 to 75kV (adjustable) which then gets applied to the tube’s anode and makes x-rays. Oh and yes, the CMOS microcontroller shares the same chassis ground as the 75,000V rail. Take that ESD nannies! 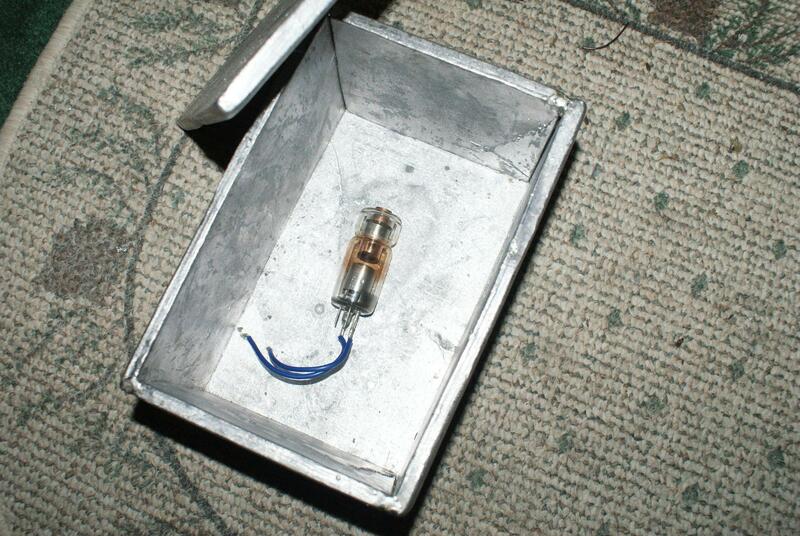 During x-ray production the nixie tubes glow red and a buzz from the speaker is emitted. The machine produces copious amounts of radiation, certainly enough for radiography. 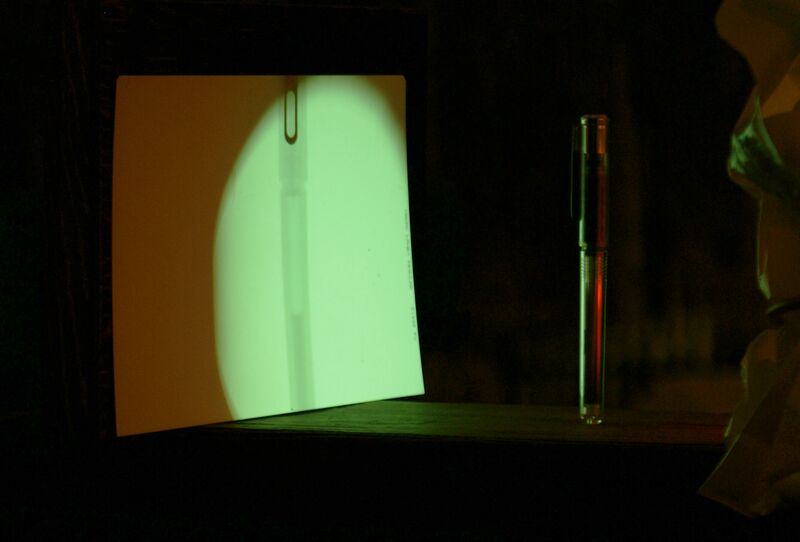 As an experiment, a geiger-muller tube was placed at different distances from the machine and the results recorded in this video. As you can see by the GM tube’s screams, not only does the machine in fact work, it’s pretty scary too. At 1 foot there are >8,300 counts per second: so intense that the geiger tube doesn’t even have enough time to recover between events! Of course there is no point in spending years building an x-ray machine if no pictures are taken with it! Below we have two of my first radiographs: a pen and a laptop hard drive. Since lenses do not work in x-ray land, making a radiograph is a shadow process: all images must be ‘shadows’ of the subject being imaged. That… is awesome. I am without the words to describe how awesome it is. Next, you must make a neutron source based on a Fusor! Nice stuff, could you tell me please exactly what are you using for the scintillation screen. 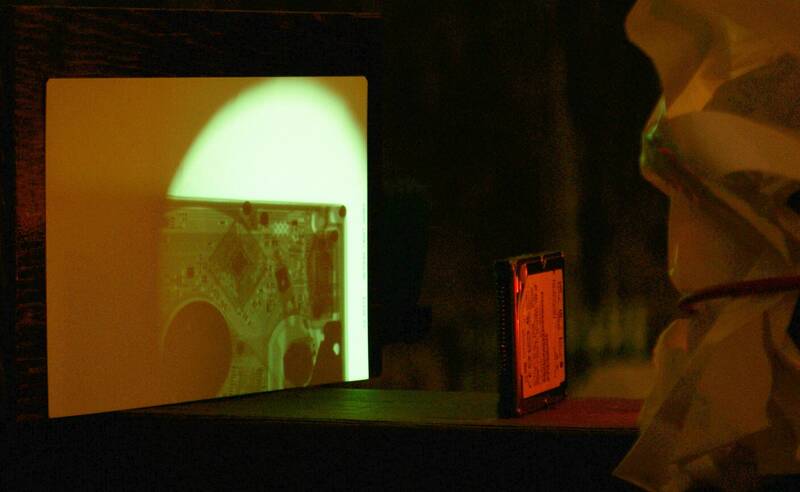 An old Kodak X-Ray cassette. They go for about $30 on ebay, and there are two such screens inside. This is an awesome site and AWESOME work! I am looking for coolidge tubes for some experiments, do you know an affordable way to get some? You could try ebay; occasionally they’ll pop up for <$150. Not lately though. How did you make the homemade transformer for this? 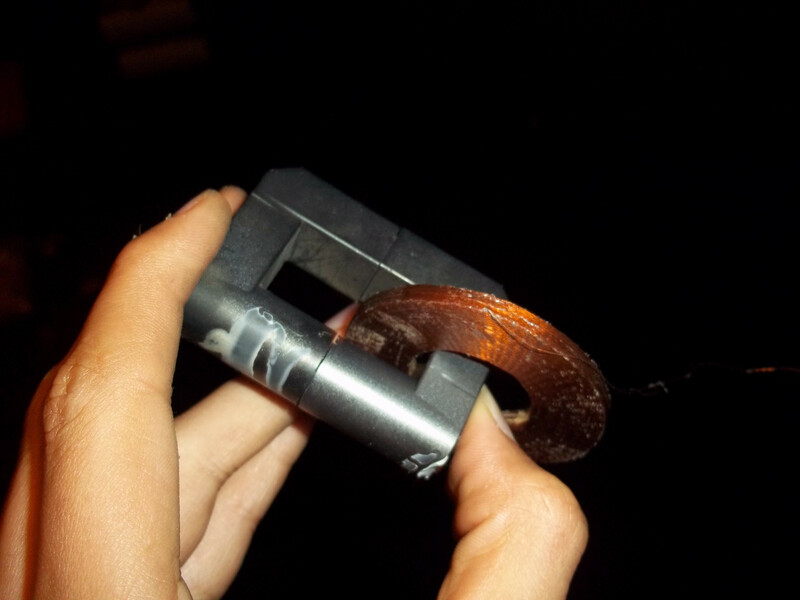 It looks like you took a regular flyback core and put a winding held together by some kind of sorcery on, but how exactly? Check out the AC flyback page; transformers were made like that back in the day. How, I have no f*cking clue. So you just put a winding from an old AC flyback on a modern DC flyback core? 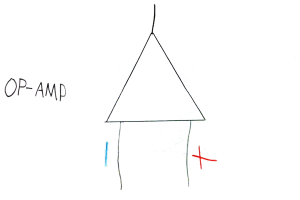 Does the orientation of the secondary to the air gap matter? Would it be possible to make something like your fryback by winding the secondary in the orientation to the air gap that you put the winding of The AC transformer you used for your x-ray machine? 2) Generally no, but windings near an air gap will have eddy currents induced in them which make them hotter than normal. This isn’t really a problem though. 3) It should be possible, yes. Okay. Thank you I understand much better now. I am thinking about how to measure the anode current without having both terminals of the series element (resistor) at high potential, and cannot figure this out. 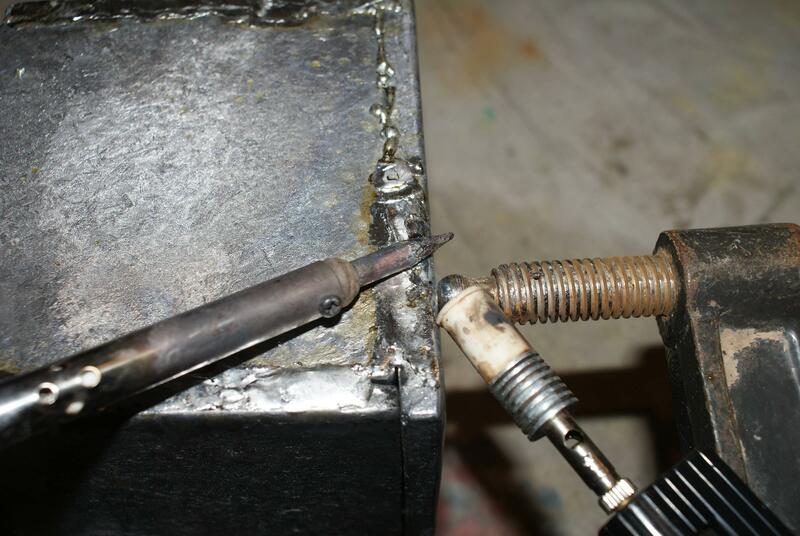 It would be easy measuring the current close to the ground potential, but the anode current appears in the cathode’s ground leg and that current has both the heater current and the anode current summed. How did you solve this? Thank you!